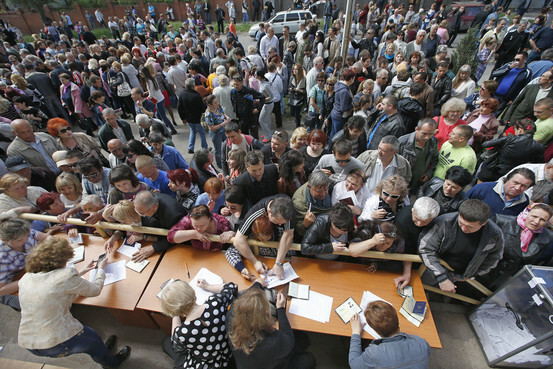 Workers voting in Donetsk, May 11. May 13 — The people of eastern Ukraine have defied imperialist threats from Washington, Berlin, Paris, London, Brussels and their puppets in Warsaw and Kiev and have carried out highly successful referendums under virtual wartime conditions. In two oblasts (regions) — Donetsk and Luhansk — the people voted overwhelmingly for statehood and declared their independence from the neoliberal, right-wing, coup-installed regime in Kiev. The meaning of this new political status has yet to unfold, as both republics try to deal with the new reality on the ground and all the formidable tasks ahead. But at a minimum the referendums were a resounding rejection of the neoliberal, imperialist-backed junta. For the present they establish hard-fought, armed sovereignty in two regions, with a combined population of 6.5 million people, in the strategic industrial heart of the country. The latest news is that the two republics are in discussions about uniting. The voting turnout, according to various sources was very high — around 75 percent in both oblasts. The vote, according to Donetsk and Luhansk official sources, was 89 percent for independence in Donetsk and 96 percent in Luhansk. The Journal continued, “In the coastal city of Mariupol, which was the scene of deadly clashes between separatists and Ukrainian soldiers last week, there were only four [voting] stations. Thousands of people turned out to join lines that stretched for city blocks. Some residents brought lawn chairs to rest their legs as they waited.” Mariupol is a city of almost half a million in the Donetsk oblast. Washington and Kiev denounced this exercise in democratic, mass political participation as an illegal vote and a sham. But the coup regime has never received a single vote, except from the fascists who put them in power by invading parliament and overthrowing the elected government of Viktor Yanukovich. The Kiev junta got the vote of the U.S. State Department, which chose Arseniy Yatsenyuk to be Ukraine’s president. This was revealed in an infamous recorded phone conversation before the coup in which Assistant Secretary of State Victoria Nuland told U.S. Ambassador to Ukraine Jeffrey Pyatt that “Yats” should be president. In contrast to the conspiracy made in Washington, millions of Ukrainians braved a U.S.-backed military offensive by the coup government in Kiev in order to cast their votes for independence. The assault, whose aim was to stop the referendum, consisted of tanks, armored personnel carriers, helicopters, Ukrainian ground forces and Right Sector fascist squads, some in National Guard uniforms and some without. In addition to Ukrainian forces, the resistance faced a force of 400 mercenaries from the Academi Corporation, according to the German newspaper Bild am Sonntag of May 11. It cited German intelligence sources saying that Academi forces were on the ground fighting the resistance in Slovyansk in the Donetsk region. Academi is the new name for the infamous Blackwater mercenary corporation, which carried out massacres and intimidation during the Iraq war. Dozens of people were killed or wounded resisting the Ukrainian government military offensive. An additional 46 people died in a massacre carried out by the fascist Right Sector forces in Odessa. Nevertheless, the offensive failed to disrupt the organization of the referendums, which were held in schools, hospitals and government buildings throughout the region. Both the Donetsk People’s Republic and the Luhansk People’s Republic have announced that their regions will not participate in the May 25 election organized by Kiev and fervently supported by the imperialists, who are desperate to find some figleaf of governmental legitimacy for their puppets in the Ukrainian capital. The government in Kiev is a highly illegal government by any standards, in addition to being an odious product of a neo-Nazi assault on the Ukrainian Rada (parliament). The imperialists know full well that, as an illegal government, all its acts are illegal. The May 25 elections, in which billionaire oligarch Petro Poroshenko is the leading candidate, are meant to plug this hole of illegality. Thus, the treaty signed by Kiev to join the European Union should be null and void because it was not signed by a legal authority but by a rag-tag bunch of right-wing politicians hastily hustled over to Brussels in the wake of the coup. What follows from this is that the IMF austerity agreement, which is now coming down on the backs of the Ukrainian people, is also illegal. In fact, the masses in the eastern regions are fighting not just for political sovereignty or for the right to use the Russian language, but to get free of the austerity regime imposed by Kiev, which is working for the bankers, the oligarchs and the International Monetary Fund. While the political direction of the rebellion in the east is still unclear, the driving force of the rebellion, which led people to support armed defense against the forces of reaction, is the profound economic attack on the masses by the IMF and the puppet coup regime. This development is not exclusive to the eastern regions. Suffering is everywhere. And this forms the basis to expand the struggle of the Ukrainian workers as well as the middle classes throughout Ukraine, even in the western regions. The key aim of the imperialists and Kiev is to disarm the struggle. If that can be accomplished, the road would be paved for gradually reasserting state power of the neoliberals and their imperialist backers throughout the country. Washington, Berlin and Paris have tried all manner of maneuvers to accomplish this goal. They put forward a statement in Geneva that called for the disarming of “illegal groups” and evacuation of “illegally seized buildings.” The Donetsk and Luhansk forces refused to recognize that treacherous agreement. The Kiev regime offered to negotiate more regional autonomy on the condition that the resistance forces in the east disarm. While this maneuver was being rejected, the junta sent its military might to try to crush the rebellion, only to be met by the determined armed resistance of the popular forces. The latest maneuver has been cooked up by the Organization for Security and Cooperation in Europe, which is to meet soon in Brussels and promises to offer a “roadmap” that would include disarmament, dialogue and constitutional reform. In all these maneuvers, Moscow has played an ambiguous role. It signed the Geneva accords of April 17 but then demanded that the agreement be applied to Kiev first. Putin asked that the referendums be put off, but then said it would respect the will of the Ukrainian people once the voting took place. Now the Russian Foreign Ministry is promoting the OSCE roadmap negotiations. The situation is highly complex, with many maneuvers taking place to get the popular forces to disarm. Nevertheless, a victory for the imperialists in Ukraine would mean a defeat for the Ukrainian masses and a dire threat to Russia by the Pentagon. But there are two struggles playing out in Ukraine. One is the geopolitical struggle of Washington against Russia — that is, a campaign to seize Ukraine and undermine Russia and eventually reduce it to a vassal state. The other is the struggle of the Ukrainian masses to get out from under the thumb of the IMF, the Ukrainian oligarchs and the right-wing regime in Kiev. The Ukrainian people need the support of Russia. 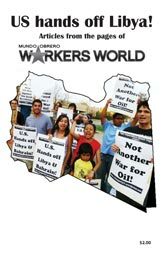 They need political and material support, and they need a sense of military backup if things get out of control. But that support must not come at the price of subordinating the mass armed struggle against the exploiters and oppressors, represented by the coup regime in Kiev. The mass struggle in eastern Ukraine and the struggle of Russia against imperialism can be both mutually supportive and also lead to conflict. The Russian capitalists rely on the struggle of the masses in the east to weaken the Kiev regime. On the other hand, Moscow is seeking to avert an escalation of the conflict with the dangerous forces of the Pentagon, NATO and the EU. Furthermore, as a capitalist power, Moscow has no interest in supporting a genuine class struggle in Ukraine. However, the crucial struggle of the eastern Ukrainian masses for liberation from the oppressive oligarchs and right-wing forces is leading precisely in the direction of conflict with imperialism, and must be supported. For the resistance, this is a difficult path to negotiate. But supporters of the struggle in Ukraine — and opponents of imperialism — must be clear on the two struggles taking place simultaneously. They must take a firm stand in defense of the masses of the east and fight to stop a U.S. takeover of Ukraine and Russia. Fred Goldstein is the author of “Low-Wage Capitalism” and “Capitalism at a Dead End,” which has been translated into Spanish as “El capitalismo en un callejón sin salida.” See website and blog lowwagecapitalism.com, where books are available.